AP Initiative Chairman Yoichi Funabashi gave a lecture on the theme of “Geopolitics, Populism, and the Media” at an event hosted by the Japan Press Research Institute on March 30, 2018. In his lecture, Dr. Funabashi began by discussing the foundations of the post-World War II international system, professing his deep fear that the world has entered into an era in which powerful states are trying to change this international order and its rules to its own benefit. Dr. Funabashi labelled China as the number one such great powers. He painted a multidirectional picture of how the country has become increasingly aware of its status as a great power and began acting according, challenging international rules as a hegemon. The United States has started calling this ever-strengthening China a “strategic competitor.” But under the Trump administration, the U.S. is also ignoring the post-war order that it built up, instead acting on the basis of an “America First”. Trump’s appeal to populism led to him being elected president, largely through the support of groups and individuals that hold racist sentiments against African-Americans. However, Dr. Funabashi analyzed that the dissatisfaction of people in many communities, people who have followed the rules and earnestly set out to make a living, has also become a source of populism. Finally, the Chairman spoke of those who abuse tools such as big data and audiovisual editing technology, spreading fake news on the internet in order to fuel populism. 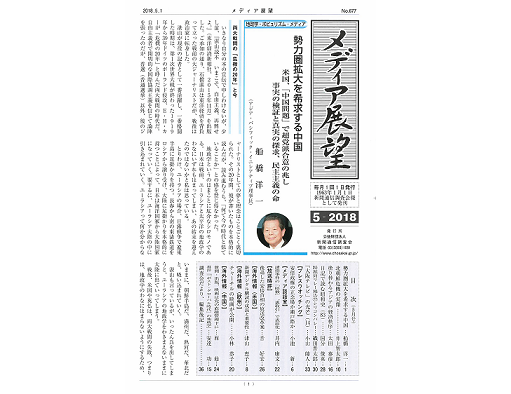 Dr. Funabashi warned that the media is facing a crisis, in that the world is entering an era in which real news can no longer be distinguished from fake news.